Recommended Viewing: The Class that was Gazza! He hasn’t had the best of times in recent years but Paul Gascoigne remains one of English football’s greatest players and one of the game’s most loved characters. For those of us old enough to remember him playing, we’ve all got our favorite moment and love him for different reasons. Be it the cheeky crotch-grab that Vinne Jones dished out to him, his free-kick for Spurs against Arsenal, his wonderful run and shot in the Old Firm derby, or the genius he produced for England against Scotland in Euro 96; he provided some moments of pure magic for us fans to admire. But perhaps what makes Gazza most endearing to us all was his genuine love for the game its self. The way he played the game was incredible, playing at even the highest level almost as if he was in the school playground; just relishing being out of lessons and being able to have a kick-about with his mates. He wore his heart on his sleeve and reminded even the most hardened supporter of the passion that burns within us all, no matter what level of football, to produce a little magic; to dream. The boyish exuberance that Gazza had for playing the game of football was genuine and I believe that’s one of the keys to why we loved him. As boys we dreamed of playing professional football – we might not have made it but it seemed like God had sent us Gazza instead, as compensation. Here was a man who seemed to have taken his same boyhood dream of playing football and, like some sort of Peter Pan, was living it out in front of the entire world, without seeming to have become tainted at all by the cares of the real world. You couldn’t watch Gazza without being stirred to remember the reason we play football: to escape for a while from the cares of day to day life and to have some fun. Gazza’s boyish approach moved a generation of football followers who were all swept along with his heroics. It wasn’t until much later on that we realised that although Gazza was like Peter Pan with his heroics on the pitch, he was more like one of the ‘lost boys’ behind the scenes. When he moved to Napoli for what was then an enormous sum of £5.5m, he had hit heights that most players will never reach, but things were obviously falling apart off the pitch. That he didn’t get more help and support from the football community and especially those close to him in his dark times should be a source great shame for many people. 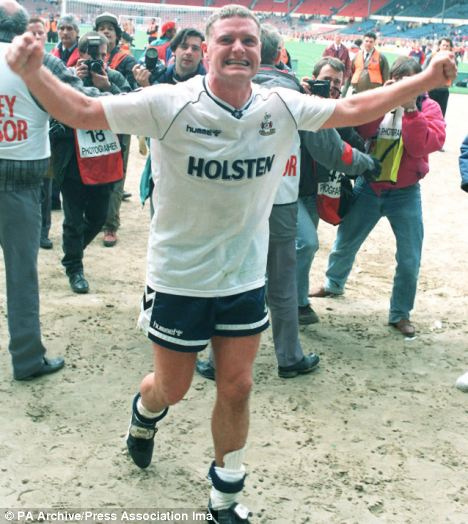 All that said, let’s remember the good times for Gazza. Roll back the years (for those who remember it) or educate yourself (for those that were too young to see it) by watching this short film on the great man!